Work for Epicor Prophet 21? Learning about Epicor Prophet 21? "Great product, mid to upper tier support are amazing, first tier support not so much"
"Integrated Solution for Storing Information"
This ties almost every department of our company together in one system. Our inventory, purchasing, accounting, sales, shipping department, and customer service conduct the majority of our work on Prophet 1. P21 also keeps track of customer accounts, including order history, price, and ship-to addresses (and this is all customizable). There are sometimes technical difficulties where the program randomly shuts down, and I sometimes have issues processing payments in the remittances. Please note the the positives of this product outweigh the negatives. This product might seem difficult and confusing at first but once you get the hang of it, it's easy. I highly recommend this product, especially if your company ships products to many customers daily. 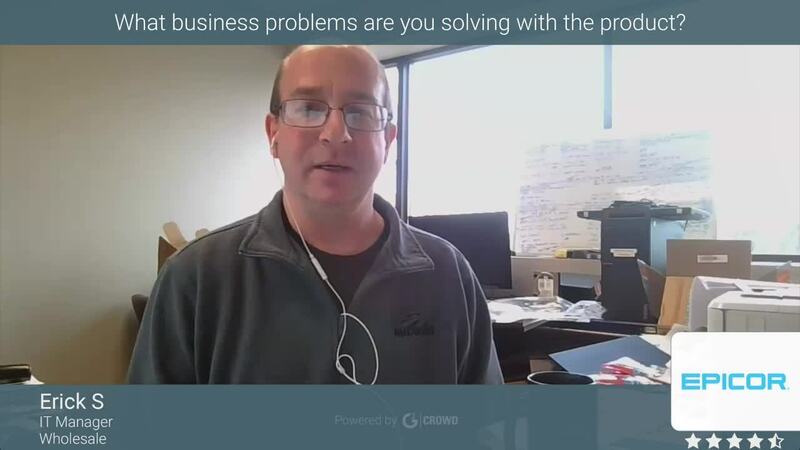 Some problems solved includes because able to organize and keep track of customer accounts and order history. It also enables purchasing to keep track of inventory, and accounting to keep track of payments and where the money is going and coming. This software streamlines processes in our company by tying them all together. Right now the best thing about P21 is the promise of what may take place in the future. The closer it gets to being web based, mobile, and streamlined, the better this product will become. As a new(ish) user/admin, it's currently overly complicated from an admin perspective as well as a new guy learning how to use it at the retail counter. It's lack of integration with other Epicor product lines. Problems being solved are limited at this point in it's lifecycle and our rev. OUr company has been a long time user of the product and the majority of our users are adverse to change and have a culture of acceptance when it comes to the system. My goal is to push them into the future, streamline their processes, and make our workforce more mobile. I want to find a way to help our customers help themselves and IF POSSIBLE, one day, use a very lean version of P21 as a customer interface to do they our management, maintenance, and shopping. "Really complete software and excellent support, but expensive for a mid size company"
The multiple options that the system can provide out of the box it's for sure a strength, the support is really good even if you don't have an in house tech team but that comes with a price, the annual support cost it's expensive. The system is so big that you need someone in-house with an excellent domain of the system, otherwise you'll never take full advantage of it, it will work and do what it has to do but you won't be using it at a 100% efficiency reducing your ROI. You definitely want the annual support but consider the cost because it's expensive so you need to plan that carefully when considering the implementation. The process from placing an order to ship and send the invoice to the customer couldn't be better. "Flexible, and adaptable to business needs"
SQL allows you to do alot with the data and allows vendors to easily integrate with P21 and get data, or simply update the database. Support is very very lack of knowledge, sometimes i get copied on the emails that support in Bensalem sends to Support in India, and then the ticket would sit in a Loop of nothing for a few days. I usually have to ask for an update to even get a response from the Epicor Team. Data, ability to run a business. P21 allows all parts of the business to use the same application to run day to day business processes. What I like best is the smoothness. It is so easy to move between tabs and navigate through. I do love that I can change the color for P21. I do love how it keeps all my orders organized. I learned how to use this system fairly quickly. Take your time and get to learn everything you can. If you have time play with the different tabs and learn what they do. The benefits it provides is helping our company run smoothly. It helps organize the orders and helps keep track of what is going on with orders. I love the interface. It's very intuitive. But, they also offer great extensibility options. The database is also open so you can do anything you can imagine. The platform is expensive. It is worth the money but the money can be a shock to some. Also, they implemented an open window limitation that needs to be increased. Use their data conversion team to migrate data and spend the appropriate amount of money to educate your employees on the software. You'll be glad you did. We manage every aspect of our business with it. There’s really nothing we do that doesn’t interface in some way. "Waiting for the Experience to Catch up"
The feeling that the be on the cutting edge of Prophet 21 you feel as if you're constantly beta testing which disrupts our core daily business when features that should have been included are not considered until enough complaints are generated. consider how it is designed to be used and if that does not match entirely your business model, then what exactly it will cost to customize it to your business model. We are able to keep our business running smoothly with P21, though we do find often that how we use it is often different from how it is designed which can cause third party headaches. We've realized that in having to customize many aspects of P21 to fit oiur business model that it is a strength that it can be adapted fairly heavily. "Tame the beast and get used to it." It has the capability to tie in different departments together. Way too many windows need to be open to perform tasks relating to the same thing. For example, if i need to maintain an open purchase order, i open one window. if i need to reprint, i need to open another window. if i need to receive the PO, i need to open another window. before you know it, you have all these windows open that crush your RAM. Give employees enough training time to get familiar with the system. At first it is intimidating and can be a pain but you can get used to it and use it with ease despite the redundant actions needed to accomplish certain tasks. Order creation and tracking. You can find tracking numbers and ship dates within your orders. "So far we have been very pleased with P21"
Speed of processing about everything & ease of operation. Being able to copy & paste almost everywhere which saves a lot of time & helps eliminate many errors. Flexibility of being able to set up different purchasing criteria's & item ID's in item maintenance. Not being able to completely remove items from P21, can only soft delete items, so basically they are still in your system. In PO requirements you do not have an option to purchase only items from a certain customer order. Very good system & will work with many different types of businesses. Increasing business because of the speed, ease of operation & multiple different functions available. Many people in our company have been able to learn to do many different things that would normally require an IT person. I believe that the system is very robust. We will never outgrow the system. There are many options available to suit our business needs. The user group forum is outstanding. We have been able to network with other companies in areas which has lead us to further development and growth. The customer service support is terrible. This is the one aspect of P21 that we strongly dislike. There is no ease of use for this. You have to communicate via email. You cannot call and get support. Because of the support issues we have looked into other tech support systems and advisors. We are still on the fence with P21 but it seems to be improving. As we learn to use P21 more effectively we have seen success in our business proformance. Prophet 21 has a lot of feature capabilities. The P21 help feature is very helpful when needing quick instructions and we have been able to launch multiple p21 features through the use of the help within the system. I appreciate p21 for the amount of information you can see on a customer or item level through the master inquiries it offers (makes work life much easier). Epicor support websites are challenging to use. It seems that there is either not enough information or the information is not specific or detailed enough to manage the process you are in need of assistance with. P21 help feature is more user friendly however all help topics are drill ins to another topic so it can be challenging to find all the material needed to learn or launch a new feature. My recommendation is to assign someone specifically to understanding Epicor software and your business practices (outside of a IT person). Most users do not appreicate all the options offered through their software, and what Epicor has to offer. Increasing efficiency through portals, screen design and alerts to maximize time spent working with customers. The ease of access to find what I need through out the day. Being able to have many open windows open at once to get my job done easier and faster. It is nice to know you can go back and correct almost any mistake. The portal is probably my favorite thing of all. I really like that I can see most of what I need at the click of a single button when I start up profit for the day. Intermittent shutdowns when I have a lot going on. Also, getting error messages of to many windows being open sometimes causes me to have to close some things I'm working on. Doesn't happen very often. I'm not sure if there is a certain contract that allows only so many users on at once but I do know if we have to many log ins from both locations it will allow others not to be able to access prophet. In turn they have to hunt down who may be logged on to many times. It is a great thing to use at any company. From being organized, to knowing numbers, profit and so much more. I feel like the company I currently work for benefit tremendously. I believe it is pretty easy to learn and there is always help available if you get confused. Keeping up with any sort of numbers our business deals with. Whether it be ingoing or outgoing transactions. Always is nice to know you can get reports of almost anything being done in the system. We use it to compute when we need to purchase more materials. We can set up notifications so we can catch things quicker! "Epicor featuring Prophet 21 the total package"
Great product, does most of what we need for distribution. Very user friendly. Easy to flow through the data. Cost of additional modules can be a little pricey. Adding features can also cost. Even if they have written them already for others. once it has been paid for, just add it as a feature. Also, not real fond of the contact database. Holds all of our transactions. From purchasing to the sale. 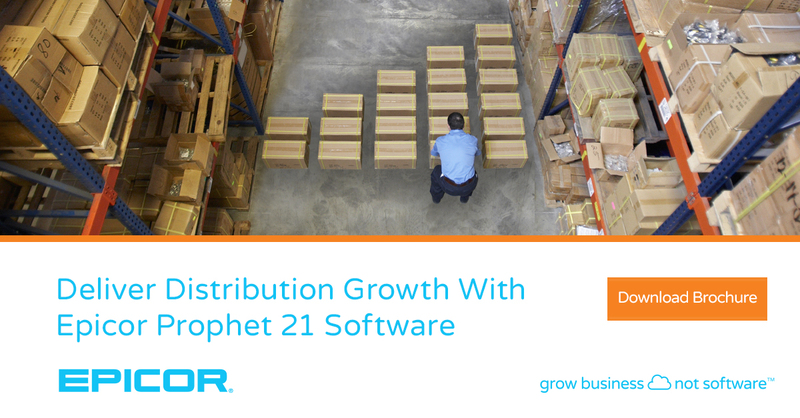 "Prophet 21 is the best choice for distribution software"
The system maintains financial integrity and traceability of transactions. It does not allow shortcuts that might create inaccurate inventory values, A/R and A/P values, or financials. Some of the programs are not intuitive. There are many options requiring using of a right mouse button, but nothing to tell you they are available. Owning a Prophet 21 system allows me to research common problems and challenges faced by distributors to help them find the best solution for their business. As a business consultant, I am able to recreate scenarios to determine what process will provide the most accurate, efficient result for my clients. "Software for all sizes of business"
You can customize so many things about this software to match up to your size of business. You can use the parts that pertain to you while discarding the parts that do not. The customer service support is very quick to answer your questions. It does a great job on our inventory. There are some glitches with it sometimes, probably like all software. There are some things or reports that we wish we had, that it does not do, hoping that maybe they will be implemented in future releases. It is a very good software. I recommend getting the support pkg for it, so that you will have someone to help you with anything you may need along the way. It keeps a great inventory for us. Very easy to look up customer information. Saves a lot of time. What is most commendable about P21 is how well it works for our business without major modification. "Out of the box" Profit 21 improved our efficiency by 100%. The biggest complaint we have is some of the quirkiness that exists between P21 and our credit card software. I have recommended P21 to numerous other tile companies, many of whom have purchased the software. I was a guest speaker for then Activant for 3 years at their informational meetings at the Marriott Hotel in Saddle Brook, NJ and assisted in pitching the product to prospective clients. Prior to P21 we were running 2 systems, one for inventory / order processing and one for accounting. Now from Quotation to Order is a breeze and our GL is updated instantly when we receive payment against the order. "New Customer going through integration"
I have been impressed with the ease of installation of various products. For example the ease of installation of the middleware and web server was quicker and easier than I had thought it would be. Some of the documentation is around the API has been a little lacking or hard to find. That said, it has been easy to figure things out I just wish that I documentation for it was as good as that of P21. Be prepared and ask questions. Do not hesitate to use professional services, it will make things easier. Vendor consignment has been a little challenging, we have found a solution, but getting there was a little hard. "Perfect for Small to Medium Business with Great Support"
I always receive helpful and prompt support when experiencing an issue. Platform is highly customizable and fairly easy to administrate. Doesn't scale too well to larger businesses (it isn't really meant to) and is definitely not foolproof for the layperson at first use. Great for small to medium businesses with experienced users. Management of inventory, orders and accounts. The database is easy to pull whatever you need to generate reports to track your business. "Not intuitive, but gets the job done"
I really like the hyperlinks from one screen to the next. Very handy getting to different modules in the program. Clunky user interface. Not intuitive in regards to accessing certain information for customers. Could be more streamlined. Managing the Accounts Receivables of customers and establishing credit for customers. the amount of clicks to process basic transactions like RMA's. The multiple modules available. Easy interaction between accounting needs and business needs. Hard to get software bugs corrected in a timely manner. Problems solving - getting real-time info in hands of outside sales reps.
"Top ERP solution for a Distributor"
the long time it takes to gets things done if developing needs to be involved. Pricing is very high compared to other ERP systems I have implemented. In addition, as we grow our capabilities, P21 is not meeting our manufacturing needs. If your company is a distribution P21 is the solution for you. We are constantly challenged with meeting our customer demands. P21 helps to streamline our order fulfillment and distribution of our products throughout the united states. We would be as successful as we are without P21 as our preferred ERP platform. "It has alot of options and easy to use"
I am pleased with the help I get with customer support and also end users. Reports are somewhat difficult to create. Everyone seems very friendly. If implementation specialist does not work for you they find one that fits your company. Love that it is in real time and closing does not take as long as it used to. It saves a lot of time. Ability to scale system to our needs and customize as needed. Ability to contact customer service is somewhat limited by use of email or online web portal only. Would be helpful to have a phone number that users can call. Perhaps it can be based on tier of support or technical service provided. Do your homework and understand the technical experience of your in-house IT staff,. Allowing users to customize their experience. Using POD system to improve customer experience for proof of delivery manifests. Everything sits in a MS SQL database and can be retrieved if you know where to look. Allows for custom reporting and applications to interface with the system. Warehouse Management System is outdated and lacking in many areas. Have since moved to 3rd party software that sits on top of P21 to fulfill our distribution needs. Interface is lacking but new Web UI is getting better. We host all our enterprise data in the package. Does a great job of working through entire distribution workflow and having processes and containers for every data at every point. "Systems Administrator for a Med sized Wholesaler"
The open database standard and reporting tools. Sometimes the Swiss Army knife approach makes settings overly complicated. Think about where you're going with P21, not just what the immediate benefits are. Efficiency and profitability. We've reduced a lot of errors in filling orders and are able to track data much easier. "Great features, always lots to learn"
I like how there's a team that's always willing to work with you to have you working up to your potential and using the proper features. The possibilities seem endless. We run into a lot of errors and 'bugs'. The support team is useful but we have had tickets open for literally years that they are unable to solve. This creates issues for us. Creates for an effective purchasing team and WWMS add on is great for our warehouse. "Great Product - Everyone should use it!" I love the inventory module the best. The functions and ability to see things are great! Couple of minor quirks that need to get fixed but, I'm confident that Epicor is on all of it. The personal training and hands on labs, tech support. Layouts, learning how to do Layouts and importing inventory. "Good for Distribution, getting better for mixed busineses"
Complicated. Yes I just said ease of training, but it can become complicated. But, with Tool Tips, we can help our users remember what they are supposed to do for areas they don't get into. Using one system for Distribution, Light Mfg, and Service. Some of the solutions we encountered required a version upgrade, which wasn't ideal based on our current IT configuration. We are better able to capture our inventory costs with landed cost drivers, enabling us to better price our products for our customers. Rigidity, limited UO objects, sometimes lagging. Ability to handle all aspects of business tied together; the ability to customize modules to suit your business and user needs. Make sure you have sql and Crystal reports super users. "Super powerful ....difficult to use it's full capabilities"
Has grown as a product as we have grown, and continued extesnibility features. Dynachange Rules, Portals, API's. Ancillary products that feel often neglected after original release - WWMS, etc. Improved processing speed in all areas of the business through the use of Epicor related enhancements and Dynachange capabilities. We like the flexibility and stability. Customer support is excellent. We dislike the limited counter/retail features. Does not require a large IT staff to manage. We are solving business problems like Inventory Accuracy and meeting the wide variety of customer required order placement activities, i.e. vendor managed inventory, vending machines and electronic order placing. "Business Systems Analyst user, running reports from P21 finding data." I like the ability to click linked numbers between different documents and the ability to search for what specific screens you need. I dislike that you can't find the sql information for some of the formulas used. Joining three databases together for different companies. The ability to find most everything you need, quickly. There aren't any downsides really except the occassional disconnect on duplication of errors through support. Docstar for web and AP automation, ECC B2C and WWMs. The ability to access the P21 data tables using ODBC. The speed of the ERP is slower than what I would expect. P21 has been easy to learn and start using. I have not fi=ound anything that I do not like about the software yet. P21 handles the entire ordering prosecc from thaing the order to printing invoices. "We have used P21 for 8 years"
I like the order screens, they are pretty intuitive. I would like it to integrate with gmail to log emails under a contact. The CRM does not meet our needs. "Great Product but it takes a lot of handholding"
It performs reasonably well, has decent support and it works. Usability for the average person is an issue. Core competency is done well. Best SMB distribution software. Really like some of the order management. Behind on some technologies and needs to be more flexible without paying for it. * We monitor all Epicor Prophet 21 reviews to prevent fraudulent reviews and keep review quality high. We do not post reviews by company employees or direct competitors. Validated reviews require the user to submit a screenshot of the product containing their user ID, in order to verify a user is an actual user of the product. Hi there! Are you looking to implement a solution like Epicor Prophet 21?